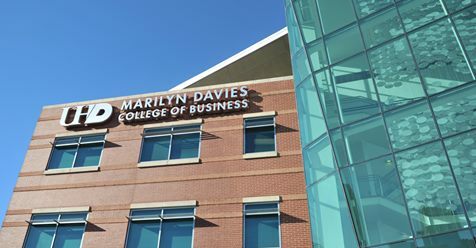 Dr. Candace TenBrink's spring Strategy class (BA 4302) in the Marilyn Davies College of Business took on a pilot project involving strategy consulting. TenBrink initially pitched the idea to Maryanne Maldonado, COO of Houston Technology Center (HTC), which serves as the nexus of new ideas and technological innovation for Greater Houston and surrounding counties. Proposed as a win-win-win, the HTC team accepted the challenge and envisioned help both for its enterprise and their clients. The professor envisioned students engaged in applying strategy skills, helping the community, and building critical thinking skills. At the end of the term the students provided detailed proposals and analyses of several strategy issues and initiatives. HTC clients that also participated in the pilot, included Eiffel Trading Company, and SpenDebt. Kiley Summers, CEO of SpenDebt, said he was in awe of the type of feedback he received from the students. He also mentioned that one team did a phenomenal job of breaking down the statistics, and adding value to his market entry strategy. Ruben Derderian, director of International Acceleration at HTC, also noted that several of the students' strategic ideas in fundraising and social media will be recommended for implementation.